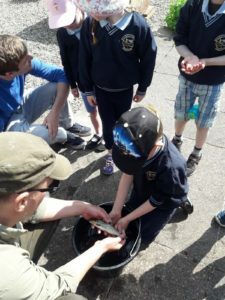 Today, Wednesday 30th May fishery officers from the Shannon RBD brought Ballycar National School, Newmarket on Fergus, Co Clare to their local stream. The whole school took part in the wonderful sunshine. The school, which is one of 5 selected by Ennis Education Centre, have been working on the Something Fishy Program with IFI during this school year. They have had classroom lessons plans already and this is the final part where they get to put their studies into practice in the field. The water quality in the stream was assessed by the students looking at the insects and some very pretty brown trout were also captured during an electrofishing demonstration.